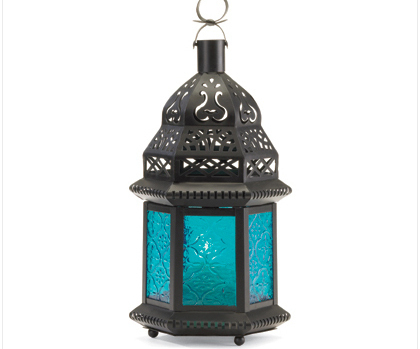 The cobalt hues of this exotic metal candle lantern bring to mind images of mysterious Morocco! 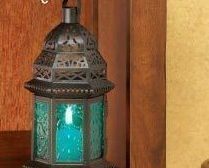 Suitable for hanging or use as a freestyle lamp.For use with tea lights or votive candles only (not included). Metal and glass. 4 " x 3 " x 10 " high. I have an assortment of items available. I accept Google,Pay Pal, Money Orders, and SERVE. Cash on your own. If any one thing in my booth is wrong or upsetting to you, please let me know. If necessary I can and will remove the item. If you think I went overboard on pricing, let me know that too. I am able to change any thing and everything. If you don't like me, I can fix that too. So whatever upsets you , I am sure we can fix it.